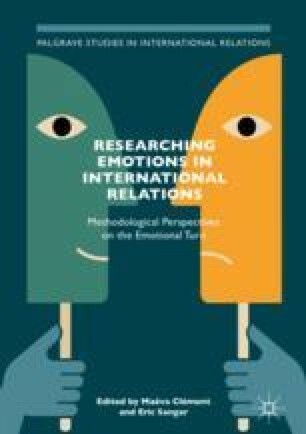 This chapter outlines a multidisciplinary and pluralist framework for the study of emotions in world politics. Needed is not a systematic theory of emotions, but a more open-ended sensibility that could conceptualize the influence of emotions even where and when it is not immediately apparent. It then becomes possible to combine seemingly incompatible methods, from ethnographies to surveys and from interviews to discourse and content analyses. The logic through which these methods operate do not necessarily have to be the same, nor do they have to add up to one coherent whole, for it is precisely through such creative openness that we can hope to capture the complex yet pervasive role emotions play in world politics.